Dramatic sandstone cliffs, a unique natural rock bridge, great fishing, cool summer swimming, and wooded camping - find all the best Western Kentucky has to offer in one worthwhile package at Lake Malone State Park near Dunmor. The campground is easy to get to and is full of amenities. Open April 1 - October 31. Camping fees range from $14-24 per night. It varies based on weekday or weekend/holiday stays and whether renting a tenting or developed campsite. Dramatic sandstone bluffs, rising up over quietly lapping waters, watch like sentinels over the hardwood forests of Lake Malone State Park. 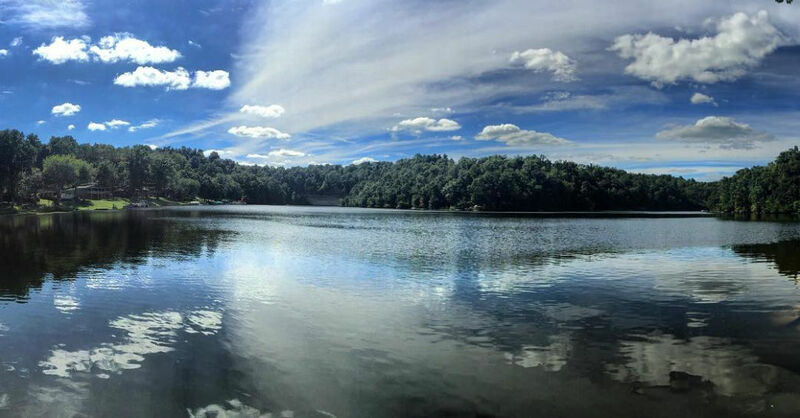 This secluded wilderness retreat in Western Kentucky is perfect for families and friends looking to ‘get away from it all’ for a few days of relaxing by the campfire, fishing, boating, swimming, and easy livin’ at one of the most beautiful lakes in the state. Established in 1962, Lake Malone is the product of a dam project on Rocky Creek that was designed to provide flood control for the Mud River watershed and recreational opportunities for the community. 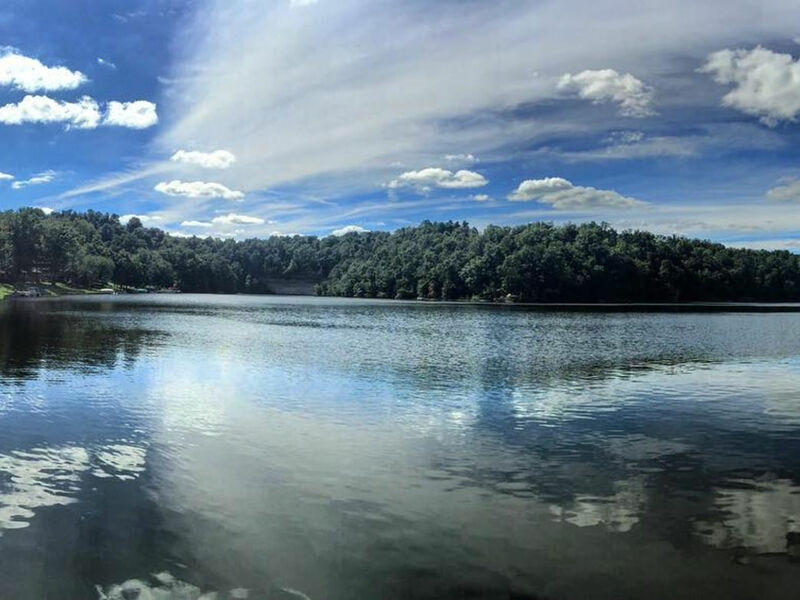 Today, the 826-acre lake is surrounded by 26-miles of thickly wooded shoreline that includes both private property and Lake Malone State Park. This little gem of a park is very picturesque. Consider packing up the whole family for a camping weekend and stage a photo session while in these flora-filled woods. Don’t be surprised if a few deer come wandering into the frame or at least the campsite. Mountain laurel, profuse dogwoods, holly, and a wide variety of other wildflowers add to the charms of the surrounding hardwood forest, providing a rich tapestry of flora for campers, hikers, and anglers to enjoy. With multiple fingers of the the lake spurring off from the vicinity of the park, Lake Malone is an angler’s delight. Perfect for beginners and the more experienced, visitors can try their hand at catching many of the lake's inhabitants which include channel catfish, largemouth bass, crappie, bluegill, and redear sunfish. Don’t have any gear but think it would be fun to try? No problem. The park has a “fishing loaner program” where guests can borrow equipment, and other items, for free. Launch your own boat onto one of the prettiest lakes in Kentucky or book a rental from the park department. Pontoon boats, fishing boats, and kayaks are now available from Memorial Day to Labor Day. The lush shoreline and clear waters will be sure to provide ample opportunities for finding endless swimming holes and secret fishing spots. Just want to hang your hammock and relax? Then don’t forget to pack the castle bucket and shovels to keep the kids busy for hours on the sandy beach. There is also a playground, volleyball nets, a natural bridge to explore, and two hiking trails to keep everyone entertained. Check out the Laurel Trail, the brand new Twisted Tree Trail which branches off from the Laurel Trail, or the 0.25-mile Wildflower Trail—all of which are easy-rated hiking trails with stunning views of the lake and notable rock walls that Native Americans once used as shelters. Beloved by locals for decades, Lake Malone will charm anyone looking for some quiet time in the woods without sacrificing the amenities of a well maintained campground. It’s also a perfect spot for families who don’t want to be in a ‘party zone’, but still want plenty of activities to keep everyone happy, healthy, and falling asleep under the stars with big grins. For RVers who want a few days to slow down, find solitude, and do their laundry, it would be hard to find a better spot in this part of the state. Fisherman also love Lake Malone and it’s rated one of the best places to try catching trophy bass in the spring. Lake Malone is located 22 miles south of Central City. From the Western Kentucky Parkway, exit at Central City-Drakesboro, and take U.S. Highway 431 to Kentucky Highway 973 to the park. The park campground offers full amenities including; bathrooms, showers, grills, picnic tables, and there are even laundry facilities. Adding to the relaxed atmosphere, fires and pets are allowed. Call the park for more information on camping and boat rental availability, both of which can vary by day and season: 270-657-2111.